The alkali metals are the elements that make up Group 1 of the periodic table: lithium, sodium, potassium, rubidium, cesium, and francium. These elements are all much too active to exist in nature in their native state. However, they do form a number of important compounds, such as table salt (sodium chloride), borax (sodium tetraborate), potash (potassium carbonate), and washing soda (sodium carbonate). Because the alkali metals all have one electron in the outer orbit of their atoms, they have similar chemical and physical properties. All are shiny, soft enough to cut with a knife, and—with the exception of cesium—white. They all react with water vigorously to form hydrogen gas and the hydroxide of the metal. 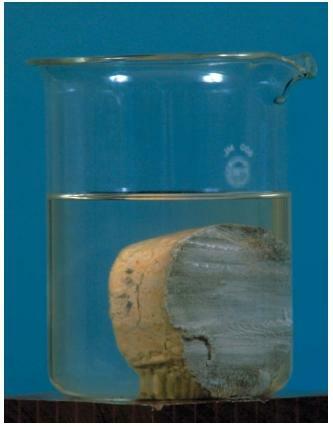 As an example, when potassium metal is added to water, it floats on top of the water and produces an extreme reaction. In fact, so much heat is released that the hydrogen gas produced in the reaction begins to burn. The usual method for detecting compounds of the alkali metals is with a flame test. A platinum wire is dipped into a solution of the unknown compound and then placed into a hot flame. The color produced is characteristic of the alkali metal present. The lithium flame is bright red; sodium, yellow; potassium, violet; rubidium, dark red; and cesium, blue. The compounds of lithium, sodium, and rubidium have a number of important practical applications, while the remaining alkali metals have only a limited number of uses. Lithium occurs in small amounts in Earth's surface, usually in association with compounds of aluminum. Most people know lithium best because of its use (in the form of lithium carbonate) as a way of controlling certain mental disorders. People who suffer from manic depression (a mental illness in which highly excited, agitated manic moods alternate with sad, depressed moods) can often benefit from regular treatments with lithium carbonate. Lithium is also used industrially in lubricants, batteries, glass, and alloys (mixtures of metals) with lead, aluminum, and magnesium. Sodium is the seventh most abundant element in Earth's surface. It occurs commonly in Earth's oceans in the form of sodium chloride and in crustal rocks as sodium chloride, sodium carbonate, sodium nitrate (saltpetre), sodium sulfate, and sodium borate (borax). Compounds of sodium are among the most important in all of the chemical industry. Sodium chloride, as table salt, is one of the most widely used chemicals in the world. It also has many industrial uses, such as serving as a raw material in the production of other chemicals. Sodium nitrite is a principle ingredient in gunpowder. The pulp and paper industry uses large amounts of sodium hydroxide, sodium carbonate, and sodium sulfate; the latter is utilized in the production of cardboard and brown paper. Sodium carbonate is used by power companies to absorb sulfur dioxide, a serious pollutant, from smokestack gases. It is also important to the glass and detergent industries. Sodium hydroxide is one of the top ten industrially produced chemicals, heavily used in manufacturing. Sodium bicarbonate (baking soda) is produced for the food industry as well. performs many other tasks necessary for maintaining life. On the other hand, excesses of sodium can aggravate high blood pressure. Like sodium, potassium occurs most commonly in the form of the chloride, potassium chloride. It is present both in sea water and as a mineral known as sylvite in Earth's crust. Almost all the potassium used industrially goes into fertilizer. Other important compounds of potassium include potassium hydroxide, used in the manufacture of detergents; potassium chlorate, used for the production of explosives; and potassium bromide, an essential chemical in photography. Like sodium, potassium is a vital nutrient for organisms in a variety of ways. Rubidium and cesium are much less common than are sodium and potassium, ranking numbers 23 and number 45, respectively, in abundance. Both elements also have relatively few practical applications. Rubidium is employed primarily in various kinds of chemical research. One of its compounds has been used to treat patients with depression. In addition, some kinds of glass and radiation detection equipment are made with cesium compounds. Francium is a radioactive element (one that spontaneously gives off energy in the form of particles or waves by disintegration of their atomic nuclei) and is one of the rarest elements in Earth's surface. It has no uses except for research. wow... i love this site i mean it's so useful. my classmates and i really needed this info to help us out on our 9th grade science poster about Alkali metals.. YOU ARE AWESOME!!! Thanks so much for setting this web page up it has helped me so much with my science GCSE's and has helped me also get a good grade on three posters I was set on Sodium, Lithium and pottasium. IT'S AMAZING!!!! I told my science teachers about this website and they thought it was really good as well. this is fantastic! A really helful bit of facts. I am doing a essay on different types of alkali metals so it is very useful for me. It made my work a lot easier! This site is great! I am using some of this info. in a paper that I am writing. It sure would help if I could figure out how to cite the website - and article! I would continue to use this site during this semester if I knew more information about the authors. OMG! This article was really useful for my year 9 homework on alkali metals. Thankyou very much to the authors of the article, and the current maintainers of this website. You are all AWESOME! Helps a lot with 8th grade project. thanks, and now i am just trying to waste as many characters as possible. mean it's so useful. my classmates and i really needed this info to help us out on our 9th grade science poster about Alkali metals.. YOU ARE AWESOME!!! THIS ONE HELPED MY ASSIGNMENT SPEECH IN CLASS. INCREDIBLE LINK. WOW! Really great website to use! All my science questions in one place! Would definitely share this with my other classmates, helps a lot in chemisty! I am also working to 9th grade in UK and i found this website very helpful. Thanks to "Science Clarified".I wish i get A* in my GCSE.